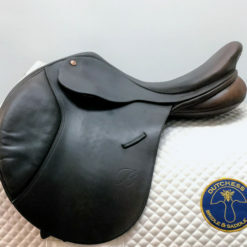 Shop new and used saddles from favorite brands like Prestige, Black Country, Bates, Fairfax, Albion, Stubben, Devocoux, and more. Jumping saddles typically have a forward flap to allow the rider to shorten their stirrups for security over large fences. 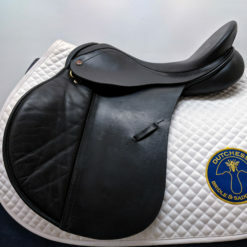 The classic close-contact or hunt seat jumping saddle has a flatter, more open seat. Modern jumping saddles may have a deeper seat for a more secure feel. Looking for a specific brand, model, seat size or tree size you don’t see here? Use our ISO used saddles form to let us know what you’re looking for. We’ll contact you if we find a match! If you’re shopping for a new saddle instead, we can help you schedule an appointment to try demo saddles or place an order from one of our partner brands like Black Country, Prestige, Bates, Fairfax, Loxley by Bliss, and more! Visit our brands page for more information.